Use climbing plants to transform your stucture into a beautiful garden feature. 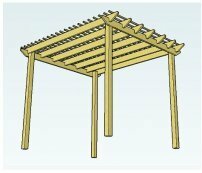 Whether you have just built your pergola from the plans, or have an existing structure to plant up, this is the fun part! There are only a few species of climbers here. That was intentional. I have kept the list to ones that I know will grow well in most gardens, as they have been tried and tested. Even so, within each species there are many varieties to choose from - thousands, in fact! Also, I have listed some plants that are only 'frost hardy', for example solanum and the passion flower, yet even in the coldest areas, if protected by a trellis, wall, or sunny structure, they do really well. If you have chosen a plant combination for colour, make sure the plants flower at about the same time! Also, try to choose a range of plants that will give interest at different times of the year and have a reasonably long flowering period. This pergola picture shows the sublimely fragrant 'Aloha' against the gorgeously rich purple of 'The President'. 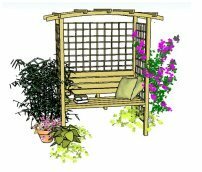 Some climbers are self-clinging, others will grow through trellis, which will then support the plant, and some will need to be tied to the trellis with twine or garden ties. All may need a little help at first. 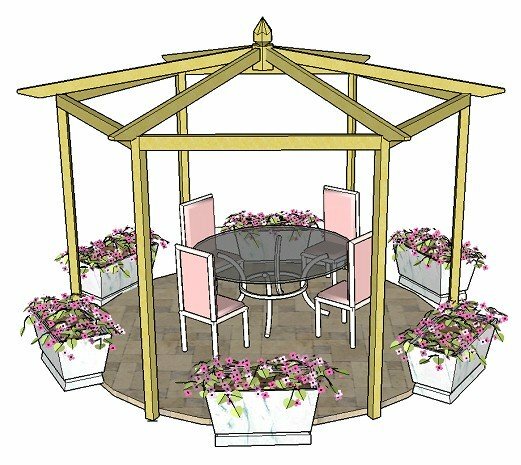 When tying climbers to the supporting structure, use a method that will avoid cutting into the stems of the plant, especially those that grow with thicker stems, such as roses, solanum and wisteria. The twine in a tin is a really great idea, as it keeps the twine from getting knotted (so to speak!) and means that you don't need to have a pair of scissors to cut it. I don't know about you, but I'm always putting things down and forgetting where they are! Now, I use a trug to keep gloves, secateurs, trowel, twine (and anything else I'm using), together and safe. Anything soft and reusable is good too: soft to protect stems, and reusable to save on expense. As the season progresses, stems are cut down and plants trimmed, so I often find that I reuse many of my plant ties. 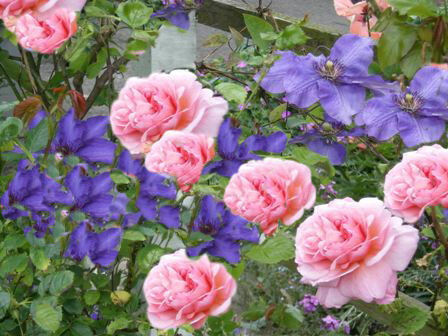 Apart from the information I give about the specific climbing plants listed above, there is a wealth of information included there from the online plant supplier, where you can find detailed information on all the plants, as well as getting ideas on the many different varieties available. Use this information as a resource. You can always nip down to your local garden centre armed with your planting plan, if it's more convenient. Keep plant tags safe, as they may come in useful later, often having useful pointers for care and pruning. They also show the height and spread of the plant, which should be given due consideration. There are also many useful books available. Plants for a particular place e.g. dry shade, coastal sites, acid soil. Types of plants, in different seasons, sizes and colour ranges. An index of all the plants in the book, with varieties and descriptions. It is well worth a look. I use this as my main reference guide for plants. 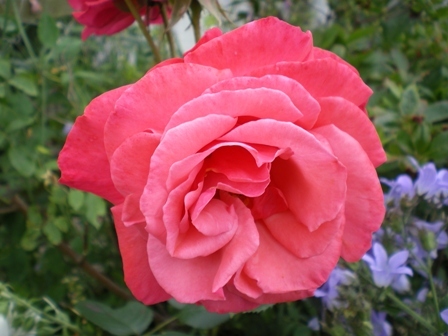 If you need a very comprehensive list of all types of roses, this is the one for you! The Phillips and Rix publications (and there are many of them) always have the most fantastic true to life pictures. They really are very easy to use and I would recommend them to anyone. Some of their books are large and others are pocket size - you can't always tell from the image of the book cover itself. If there is one area that proves problematic to many people it is pruning and training. It's not rocket science! but for some reason many gardeners are frightened by it. This book takes the mystery out of pruning so that you can care for all your plants with confidence. It is a useful guide to training plants over structures and up walls (which is where you don't want to be, when your plants are blowing in the wind, or need a quick trim!) It has very clear diagrams and good pictures. 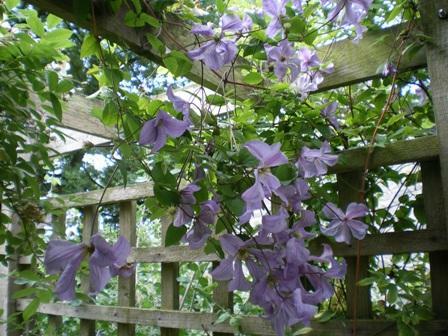 Climbing plants can be a truly stunning feature in your garden. Let them take centre stage and be the stars of the show!